Fundraising day for the Frank Freeman Scholarship fund – poster. 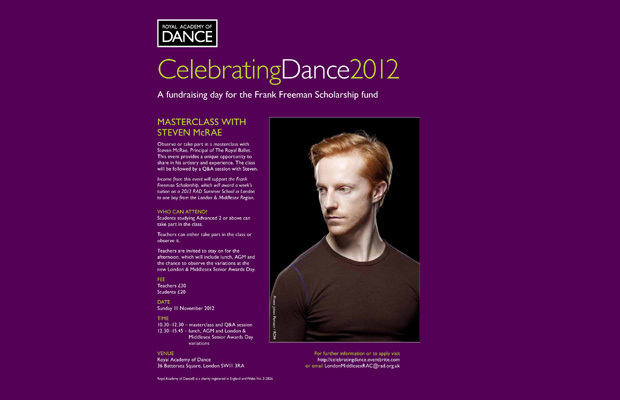 The day will consist of two events: a masterclass led by Steven McRae – Principal of The Royal Ballet, which will provide a unique opportunity to experience Steven sharing his artistry and experience of dance. It is open to students studying Advanced 2 or the equivalent, and their teachers may either observe or participate. The class will be followed by a Q&A session with Steven, for both students and teachers. Running in parallel is the London & Middlesex Senior Awards Day – a competition for 16-22 year olds who are currently studying or have passed Advanced Foundation or above or the equivalent, performed in front of a live audience. Candidates will be judged on their performance in the class and variation by Lynn Wallis, RAD Artistic Director and Gary Avis, Principal Character Artist and Ballet Master at The Royal Ballet. The winner will be awarded £150 and the runner-up £50, to go towards RAD activities or materials. 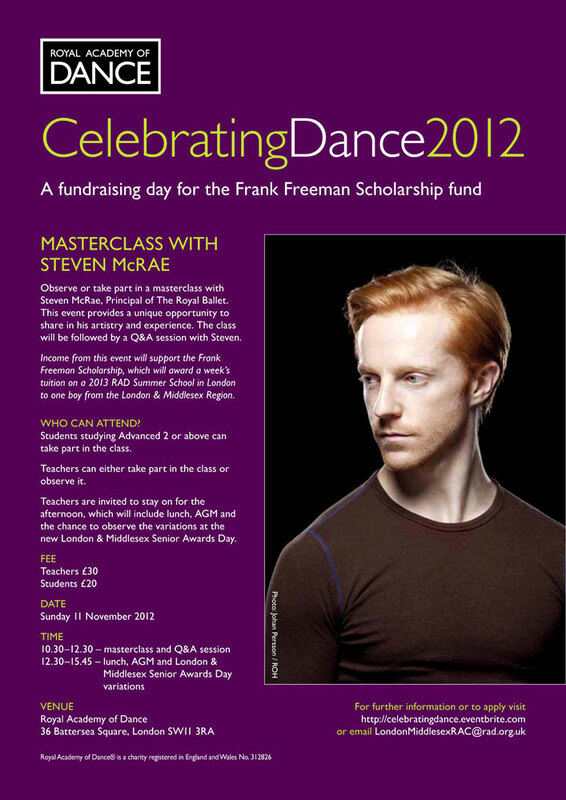 Income from the Celebrating Dance 2012 event will support the Frank Freeman Scholarship, in memory of the RAD devotee, which will give the opportunity for one boy from the London & Middlesex region to be awarded a week’s free tuition on an RAD summer school in London 2013. 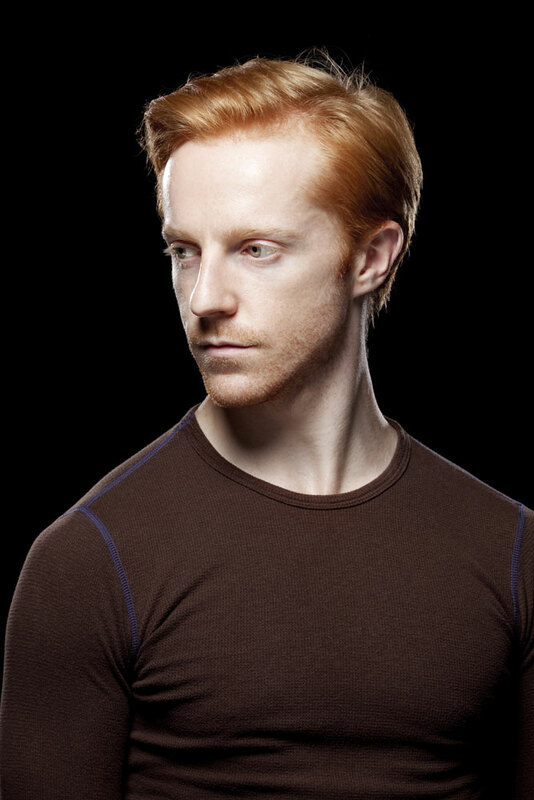 Steven McRae Biography: Steven was born in Sydney. He trained with Hilary Kaplan and then at The Royal Ballet School (2003-4). Under Kaplan’s coaching, he received the RAD Solo Seal Award and won the Adeline Genée Gold medal, 2002 and the Prix de Lausanne, 2003. He joined The Royal Ballet in 2004 and was promoted to First Artist in September 2000, to Soloist in September 2006 and to First Soloist in 2007. He was promoted to Principal in June 2009. He has also created roles in Christopher Bruce’s Three Songs – Two Voices (2005), Alastair Marriott’s Tanglewood (2005), the Younger Brother in Children of Adam, the Spirit of Fire in Christopher Wheeldon’s Fire as part of Homage to The Queen and Wayne McGregor’s Chroma and Limen. Frank Freeman Scholarship in Memory of Frank Freeman: Frank Freeman passed away on 24 February 2011, aged 65. An international freelance teacher, choreographer and Vocational Grades Examiner for the Royal Academy of Dance, Frank was also a member of the artistic sub-committee and board of trustees, and received a fellowship of the RAD in 2000. Entirely trained at The Royal Ballet School, Frank was also a member of The Royal Ballet and English National Ballet companies and a founder patron of The National Youth Ballet of Great Britain. Royal Academy of Dance (RAD) is an international dance teacher education and training organisation with over 13,000 members in 79 countries. The Academy promotes the knowledge, practice and understanding of dance internationally through the education and training of teachers. The Academy is also the largest international ballet examinations board. The RAD is a Registered Charity in England and Wales No. 312826.